Breakfast is essential for health and growth, especially for children. However, one in every five children in British Columbia is unable to enjoy a balanced breakfast daily due to proverty. Sunshine Boyz Jeffrey, Sunshine Girlz Eva, DJ Sam & Ginny joined in the “Blue Sky Project - Breakfast Program”, organized by Tzu Chi Foundation, at Windsor Elementary School yesterday morning. They served nutritious breakfast which included juice, yogurt and toast, to children who come from low income households. 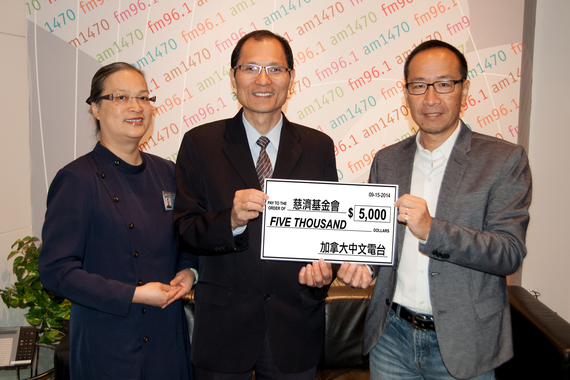 Besides volunteering for the “Breakfast Program”, Fairchild Radio had also donated ticket sales of Sunshine Nation 2014, $5,000, to Tzu Chi Foundation.